We are having a special event JUST FOR MEN at our church tomorrow night. 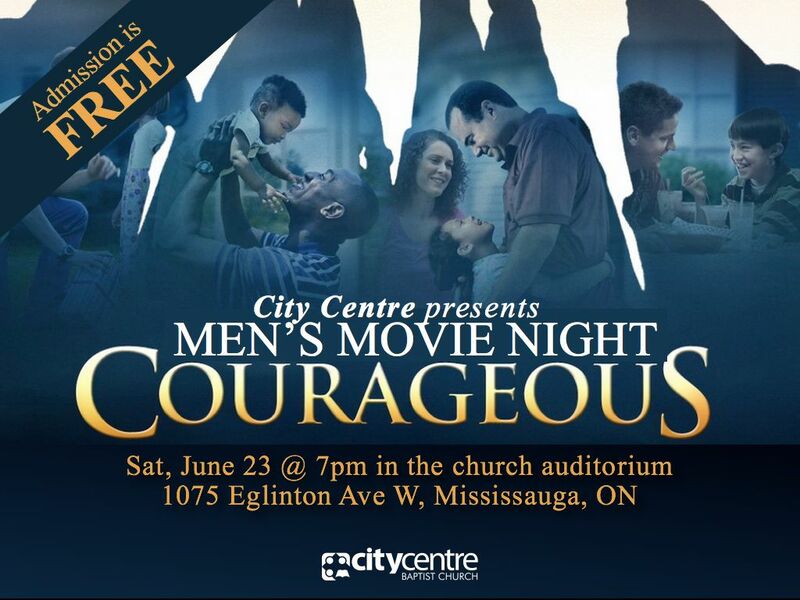 Called: Courageous men’s movie night! As you probably guessed we are showing the movie Courageous. That’s just the beginning, we then are going to have a number of men from our original men’s small group share what God is doing in their lives since they started attended their small group. Each one has an amazing story to share about how God has totally gotten a hold of their lives and they will never be the same. BUT I don’t want to tell you too much…YOU SHOULD COME!!! If you don’t think you are invited, this is your official invitation. Come to City Centre Baptist Church, 1075 Eglinton Avenue West, Mississauga at 7pm. We would love have you join us. Entry filed under: City Centre, Family, Friends, Ministry, Small Groups. Tags: Courageous, Courageous small group, Joshua, men, what God is doing in their lives.